How to Delete WhatsApp Data on iPhone Permanently! How to Delete WhatsApp Data on iPhone, Permanently & Unrecoverable! There is no doubt that WhatsApp is one of the best instant messaging apps that is used by so many people all over the world. However, at some point, there is a possibility that you could no longer need it for various reasons. One of these reasons could be trying to free up space or even privacy concerns. 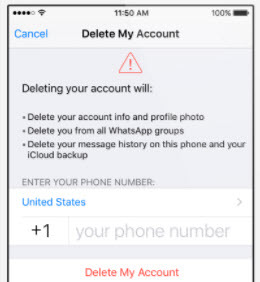 Whatever the reason, this article will highlight how to delete WhatsApp data from your iPhone. Having established the reasons as to why users delete WhatsApp data on their iPhones, it begs the question – how to delete these messages. Usually, the data is still recoverable if you simply delete WhatsApp messages or chat from iPhone. To make those data disappear with zero chance for recovery, you'd better delete WhatsApp data on iPhone permanently using iMyFone Umate Pro iPhone Data Eraser. Permanently Erase WhatsApp Messages: Capable of erasing your WhatsApp messages on a permanent basis in such a way that they cannot be retrieved again by data criminals. Permanently Erase WhatsApp Attachments: Capable of erasing attachments (it could be a photo or video) permanently in such a way that it can never be retrieved by anyone. 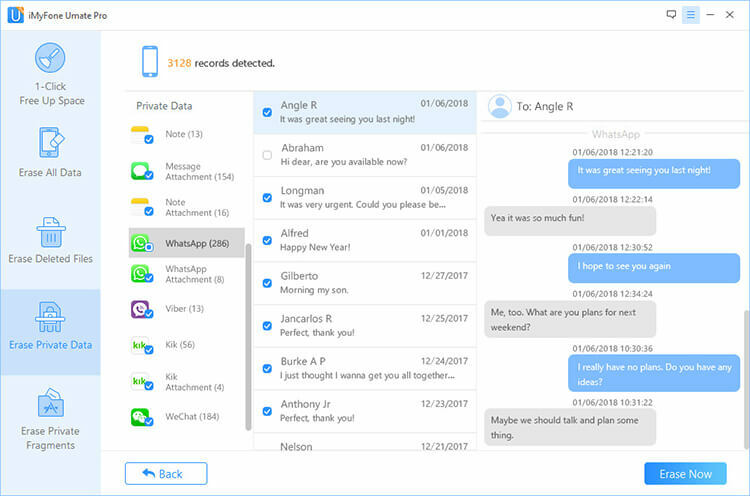 Fully Wipe Deleted WhatsApp Data: Scan those deleted WhatsApp data which is recoverable and completely remove them. Permanently Erase WhatsApp Fragments: Get rid of all incomplete private traces from WhatsApp for privacy protection. Step 1: First of all, run the program and connect your device to it. Step 2: Then select the erase mode of “Erase Private Data” to erase WhatsApp messages, attachments (For erasing deleted WhatsApp data, go to "Erase Deleted Files"; For erasing WhatsApp fragments, go to the “Erase Private Fragments” tab). Step 3: Erase your WhatsApp data permanently to protect your privacy and save space on your device. Clearing individual chats: to clear individual chats, swipe on the conversation you'd like to delete from right to left to bring up some options. From the options, select “More” to bring up a menu. 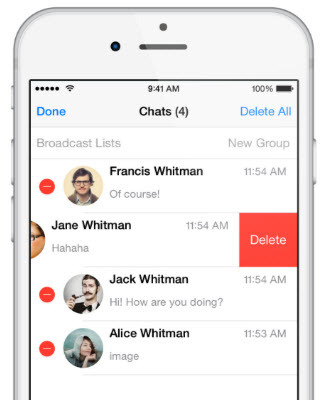 Select “Delete Chat” to delete all the messages associated with to the person. Clear all Chats at once: To delete all the chats on your WhatsApp at once, go to the in-app settings of the app. Select “Chats” > Select “Clear All Chats”. Select “Clear All Chats” again in the next screen and all your chats will be gone. To completely delete WhatsApp data, you can try iMyFone Umate Pro. Step 1: First launch the WhatsApp app on your device. Step 2: Go to Settings. It can be found on the bottom right corner. Step 4: Then tap “Delete My Account”. Step 5: Enter your phone number and then tap “Delete My Account” again. Step 1: Download the latest version of the application. Step 2: Launch the application. 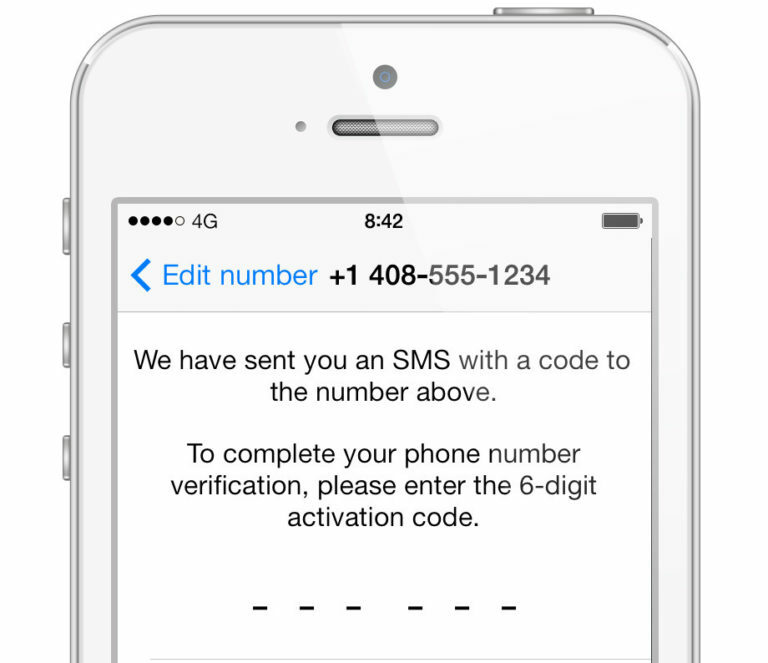 Step 3: Enter the phone number and verification code that you received via SMS. Also the name and picture that represent your profile. Step 4: You can restore backup if you are using iCloud backup active on iPhone.